Thomas Cook Airlines announces it is adding year-round, three-times weekly service to Manchester from New York’s John F. Kennedy Airport (JFK) beginning December 14th. To introduce New Yorkers to the new Thomas Cook Airlines’ Manchester year-round service, the airline is offering an introductory, one-way fare of $99 on select Manchester departures this coming winter. Thomas Cook Airlines announces it is adding year-round, three-times weekly service to Manchester from New York’s John F. Kennedy Airport (JFK) beginning December 14th. This is in addition to Thomas Cook Airlines' daily JFK flights to Manchester in the summer. This extension of flights makes New York the third year-round U.S. destination for Europe’s 7th largest long-haul airline. The company’s Condor brand currently provides year-round flights from Las Vegas and Seattle to Frankfurt. To introduce New Yorkers to the new Thomas Cook Airlines’ Manchester year-round service, the airline is offering an introductory, one-way fare of $99 on select Manchester departures this coming winter. The new, year-round service represents the airline’s strategy to expand its successful long-haul offering and become the preferred carrier from North America to Europe. “With our new added year-round service, it’s never been easier and more affordable for Americans to explore Europe. With seventeen gateways in the U.S., four of which just launched this summer, we’re making excellent progress with our strategy to grow our long-haul network,” said Christoph Debus, chief airlines officer, Thomas Cook Group. Passenger numbers for the award-winning airline from North America to Europe have more than doubled during the past three years. 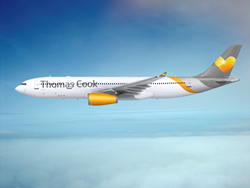 Thomas Cook Group Airlines currently serves the U.S. from Anchorage, Austin, Baltimore, Boston, Fairbanks, Las Vegas, Los Angeles, Miami, Minneapolis, New Orleans, New York, Orlando, Portland, Pittsburgh, San Diego, San Francisco and Seattle. “With three additional flights per week, we are closing the gap from Christmas until mid-March, and we are offering our customers a great opportunity to visit Europe during the winter months. We work closely with partner airlines to connect travelers from more than 30 destinations within the U.S. to many fantastic European cities. This provides travelers with a wide array of winter vacation options from ski trips to the Alps to ringing in the New Year in Paris,” said Debus. Flights can be booked online at https://www.thomascookairlines.com/, through a travel agency or by telephone: 1-855-759-3665. The Thomas Cook Group Airlines as part of the Thomas Cook Group plc. consist of four sun and beach focused leisure airlines: Thomas Cook Airlines UK, Thomas Cook Airlines Belgium, Thomas Cook Airlines Scandinavia and Condor Flugdienst. The airlines carry 16.7m passengers per year to more than 160 destinations, generating revenues of £2.8bn. The combined fleet consists of 94 aircraft thereof 25 new Airbus A321 that joined by 2016. The Thomas Cook Group recently invested 100 million GBP in comfort and new technology of all aircraft. State-of-the-art engine technology and enhanced aerodynamics of the aircraft cut kerosene consumption thus reducing emissions and improving sound protection. More than 9,000 employees work passionately every day to satisfy the customer’s needs. Numerous awards highlight this attitude in each of the single airlines. 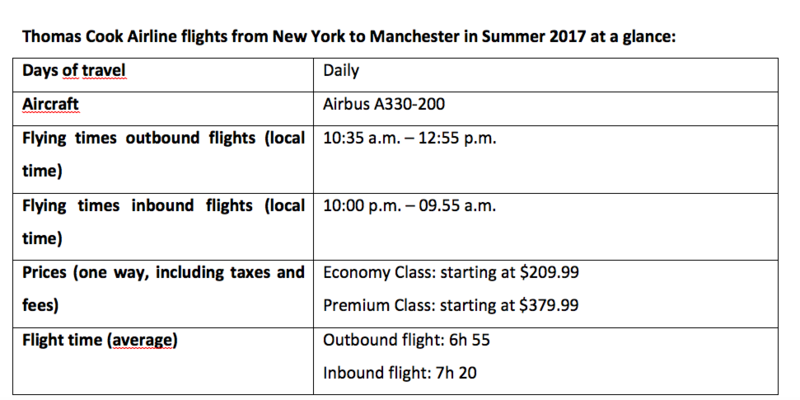 Thomas Cook Airline flights from New York to Manchester in Summer 2017 at a glance. 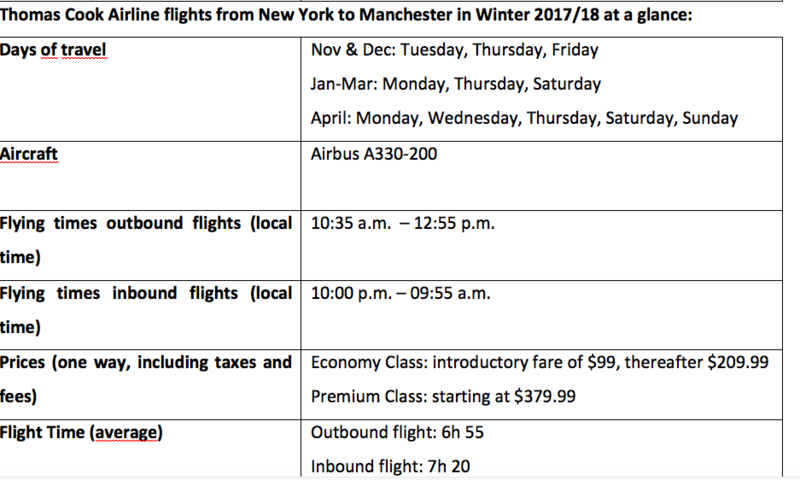 Thomas Cook Airline flights from New York to Manchester in Winter 2017/18 at a glance.